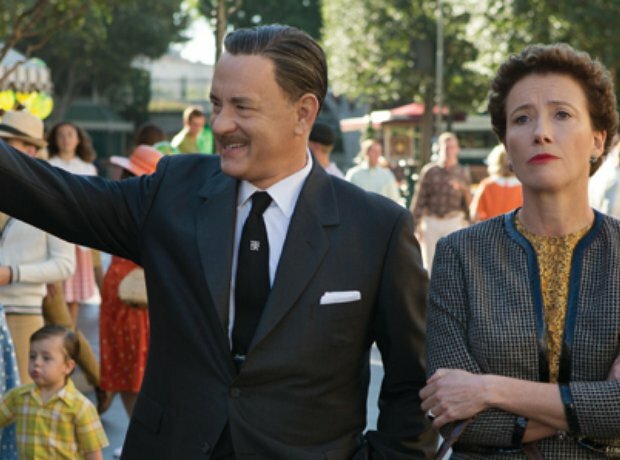 What's on the soundtrack to Saving Mr Banks, Disney's latest feel-good film based on the story of making Mary Poppins? Discover Thomas Newman's beautiful score, illustrated with stills from the film itself starring Emma Thompson and Tom Hanks, and pictures from the premiere. A simple twinkling piano plays the well-known Chim Chim Cher-ee tune from Mary Poppins, with spoken lyrics from none other than actor Colin Farrell to kick off the album. The first original track from Thomas Newman is named after Mary Poppins author PL Travers' father, Travers Goff. Expect optimistic rhythmic piano music and an understated cheery tune to introduce the beginning of PL Travers' life in 1907. The third piece on the soundtrack, Walking Bus shifts from being spirited and rhythmic to eerie and haunting in the space of one track. A jazzy interlude from Ray Charles, whose instrumental version of this well-known drinking song hit the charts in the 60s - linking to the timing of the 1964 Mary Poppins film. Plenty of strings and a flowing piano tune bring this relaxed number by Thomas Newman to life. If there's one thing Mary Poppins does well, it's 'jollification', perfectly characterised in this snappy tune for clarinets and harps. Emma Thompson, Mary Poppins creator PL Travers arrives in a hotel room filled with stuffed toys, propping Mickey Mouse in thecorner and saying: "You can stay there until you learn the art of subtlety." The clue's in the title with this simple track from the album. A sensitive oboe hums through the textures of shimmering strings and harp. When it comes to making up words, Mary Poppins does it better than most (Supercalifragilistic, anyone?) This track sees PL Travers offering her opinion on the nonsense word 'responstible' - all to the soundtrack of the well-known Chim Chim Cher-ee tune. Newman's gone all 'Big Country' in this harmonica-fuelled, horn-filled musical extravaganza. Heavy string chords and snare drums propel the music forward. A calming clarinet characterises this short piece, with a title referring to Travers Goff's Irish heritage. Rushing piano and harp accompanied by wispy flute tunes and folky percussion, this breathless tune by Thomas Newman truly ups the drama levels on the soundtrack. If you had to sum up the Emma Thompson's serious character of PL Travers in a piece of music, a jazzy number like this might not be top of your list. Raspy trombone slides and jaunty rhythms accompany a cheeky piano tune in this most light-hearted of tracks. There's something of a Harry Potter theme feel to this eerie track, as a trembling violin accompanies the fragile xylophone tunes. ..But the mood soon picks up with this toe-tapping number from The Dave Brubeck Quartet. It's not quite the Walt Disney Heigh-Ho from Snow White and the Seven Dwarfs. All the different elements from Thomas Newman's score all comes together here, as the eerie clarinet tunes, chilling harp sounds, syncopated piano notes, and jazzy bass lines combine to create an exciting tune to propel the drama forward. Plucking strings and brisk interjections from the percussion and woodwind capture PL Travers' frustrations with Walt Disney at this point in the film - but the result is still surprisingly cheery. A poignant track from Newman once more, making use of the theme of family connections in the film as inspiration. Simple piano harmonies and long lush strings… what's not to like? The most minimalist track on the album still packs quite the emotional punch. It's not quite the good old-fashioned sing-song to the well-known Mary Poppins tune you might expect. Proving the course of the 1964 film didn't always run smooth, this initial version of the song is interrupted by PL Travers - who's not such a fan of lengthy made up words. Originating from the 1964 Mary Poppins film, this slow track doesn't live up to its title: the phrase is originally used to chivvy the children along. You can almost hear the optimism in this beautifully simple track. The tune isn't exactly hummable, but it's propelled forward by bright piano music and harp melodies that burst through the texture. Things get heated as the writers inform PL Travers that the penguins in the film will be animated. She's less than impressed, as she argues her books weren't written for children - and this bubbling frustration is captured in the music. Marking a symbolic moment in the film, PL Travers picks pears for her father, accompanied by this poignant soundtrack. Another sing-song around the piano, as the characters test out the music for the Disney film. PL Travers doesn't interrupt this time… she even manages to muster a little dance! Could it be that Walt Disney has persuaded the uptight PL Travers to accompany him to Disneyland? After PL Travers' and Walt Disney's roller coaster working relationship, things seem to be calming down - musically at least. Think simple low strings and peaceful tunes. It's finally happening! The saccharine-sweet version of Mary Poppins is being brought to life, complete with animated penguins and nonsense songs. This dramatic track captures perfectly the excitement at this point in the film. The percussive piano is back, accompanied by heartwarming crunchy string harmonies, in this most epic of love themes. Packed full of sleigh bells and silvery percussion, there's something of a Christmas feel to the final track on this album, rounding off this festive feel good film with an uplifting flourish.